Ask fellow campers about "Henrys Lake State Park" and nearby attractions. Question: Is the trout fishing good from the bank? Answer: When I was there I do not remember any people fishing from the bank, and only a few from boats Probably because the mosquitos were TERRIBLE in late June! Water in full view, but not waterfront sites. Paid nearly 30. for electric only - a bit pricey for a state park. Site was fine, near water, but no access right near my site - had to travel a couple of hundred feet (not a big deal in the big scheme of things.) We camped at Henrys Lake State Park in a Fifth Wheel. Beautiful location, great service and bad neighbors. To focus on the campground, it's easy access, check in was good, two way dump station next to check in. We camped in the blue dun loop which is older and very tight on spaces. The newer sites to the west are better spaced. Site 34 has some trees, most of the sites do not. The rest rooms are still "under construction". Our site was a back in and long enough for a 40 foot MH and car. Electric only but water was close enough to access with a 25' hose, which is what my neighbor did when they arrived. That's fine but it's community water. They stayed hooked up all day/night. The price per night included the site, the out of state surcharge, the reservation fee and the $5 per day additional for a towed car. This is a theme with out of state campers. It's also a reason I would not return. Campers' etiquette is not the responsibility of the State Park, so I don't hold it against them. We had tent campers who set up their tent less than 4 feet from our wheels. Then, they walked between my tow and MH and across our site to access the restrooms. Another group camped behind us, again tight on the spacing because they had two tents. This area could be better with a few less sites cramed in. We camped at Henrys Lake State Park in a Motorhome. One store with break the bank prices nearby. There is a market in West Yellowstone with selection and slightly better prices. Best advice, stock up before you get here. Grand Teton NP is about 2.5 hours away. You can loop through Yellowstone to get there. Beautiful secnic hikes and they have a bike trail with flat and rolling sections. Wow, this place is absolutely GORGEOUS everywhere you look! We had a pullthrough with 50 amp and water but no sewer, and were able to get DirecTV with no problem.The lake is so picturesque and the huge, snow capped mountains are close and fabulous. The sites are very large and fairly level (one board). It's quiet here at night and the most peaceful campground we've been in. Free wifi that comes in and out. There is a boat ramp here and they even have free life preservers to borrow. There is a pair of swans that live on the lake, adding to the ambience. No over the air tv channels. The roads are paved, and the first night we were here the manager of the Bear and Wolf Experience in West Yellowstone gave a one hour talk on bears and how to avoid them. We didn't disconnect because we rode our motorcycle while we were here (cost an extra $5 a day for the extra vehicle ). I would have rated this a 10 if it only had sewer, but it did have a nice dump station. We camped at Henrys Lake State Park in a Fifth Wheel. West Yellowstone is a pretty little town only 15 miles from the campground, and Old Faithful is another 30 miles away...worth the trip! We have been in 4 entrances of Yellowstone over the years, and Island Park and West Yellowstone is my favorite! Great state park. The area is a huge ice age cirque with mountains all around, beautiful lake in the center. Fantastic views in every direction. We were in the Blue Dun section which is the older, but prettier section. One caution, the bathrooms in this section were completely closed for renovation. Porta pottys located around campground. Staff said they were supposed to be complete a month ago. We camped at Henrys Lake State Park in a Fifth Wheel. This is a beautiful area with a boat ramp. Only a few sites have sewer, all of the sites were very roomy and paved but not always level. Water & electric was OK with good ATT service and open for a satellite. The work campers would even clean the aluminum picnic tables before the next camper! Please note the nightly rate does not include the $10 reservation fee (state park) or taxes, PLUS there is an additional $5 daily fee for the tow vehicle-we didn't know that until we checked in. It would have been good to know ahead of time as it changes the rate. We camped at Henrys Lake State Park in a Motorhome. Outstanding park. Amazing views. Close to Yellowstone and other attractions. Easy off main highway (20), but far enough that there is no road noise. Our site had no sewer - the only negative. But some did. Level, paved sites. Friendly staff. If in the area this is the only place I'd stay. We camped at Henrys Lake State Park in a Motorhome. Go to Mesa Falls. Upper was gorgeous!! Obviously Yellowstone. It's amazing. 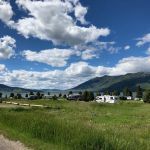 This place is a hidden gem in the rockies and is only 20 miles to Yellowstone making it a perfect base camp if you rather spend most of your money on doing things at the park instead of accommodations. I found it by accident when we went looking for another place to stay since everything in the West Yellowstone area was either full or way overpriced. We lucked out and got the largest pull through at the park. The park is far enough away from the highway you don't hear traffic. We would definitely stay here the next time we are in the area. We camped at Henrys Lake State Park in a Motorhome. A short drive to Yellowstone. What more needs to be said. Great place to stay. Good AT&T and Verizon signal. No wifi. Cleanest and nicest showers and restrooms I've ever seen. Views of the lake from every site. Most sites have just water and electric but a few have full hookups. Website reservation worked great. Really nice people run this place. We camped at Henrys Lake State Park in a Motorhome. Only 10 miles from the west entrance to Yellowstone National Park. For the price this is a great place to stay and visit the park if you can't stay in the park. 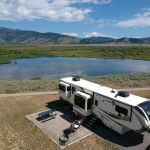 This campsite is an easy "commute" to the west entrance to Yellowstone and is also in a prime fly fishing area. The sites are on a slight hillside overlooking and adjacent to the lake. Every site has a lake view and mountain views are excellent also. The driveways are level and gravel as is the patio area. A small fire place is at each site. There are no shaded sites and the winds coming off the lake can get strong. We were near the older rest room building and it was clean. It seemed everyone there spent the day in Yellowstone and retired early to get ready for another day doing the same. The parking pads and drives could use a bit more gravel to keep down the dust. We camped at Henrys Lake State Park in a Travel Trailer. There is not convenient food shopping in the Henry's Fork area and restaurants are 10+ minutes away. Plan accordingly. Do not leave your awning up while away from the campsite. Winds come up suddenly from off the lake. At our particular restroom building the toilets were through one door and the showers through another and you have to come back outside to get to either. Another plan accordingly notice. Firewood available 24/7 through a giant vending machine. Concrete pad, lakeside, fhu, no wifi and NO TV (antenna)!!! Staff very friendly. No laundry on site so I drove about 5 miles to a laundromat. Was very nice. Had to drive a ways for a grocery store. Very windy! Don't ever leave for the day without rolling up the awning. Very windy off the lake. NO TV unless you have satellite. Otherwise nice. We camped at Henrys Lake State Park in a Fifth Wheel. Yellowstone Park nearby. Grand Tetons are also close. 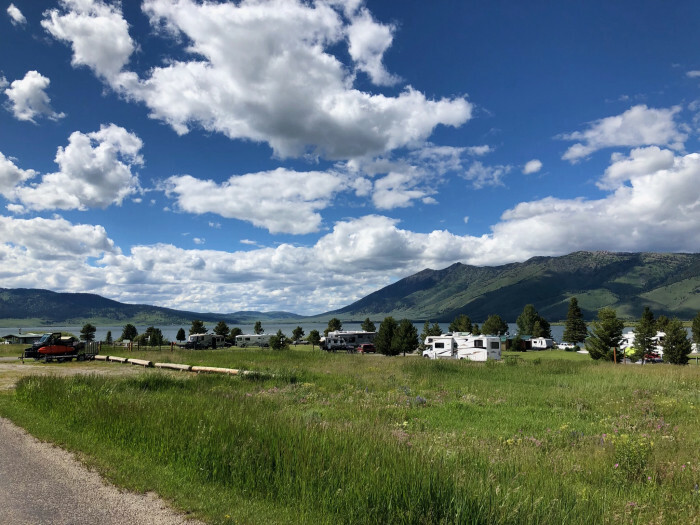 A beautiful state park with a wonderful view of Henry's Lake, mountains and a lot of wildlife (primarily birds, but we did see a moose during one of our visits). The campground is about 30 minutes from the west entrance to Yellowstone National Park. 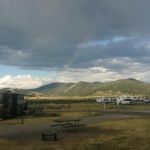 We initially stayed here during a visit to Yellowstone, but enjoyed the state park so much we have returned since to primarily spend time at the state park and the surrounding area. Many of the sites can handle larger RVs. Many of the sites are not level, front to back, since they slope towards the lake; this did not present a problem for us, but we did notice many motorhomes had to use blocks under one set of the tires. A few sites have full-hookups (water, electric, sewer), but most are solely water and electric. We enjoyed staying 2-weeks (their stay limit) at this beautiful and quiet state park, several times to date. We camped at Henrys Lake State Park in a Fifth Wheel. We camped in our 42 foot fifth wheel and it was beautiful. 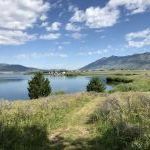 Plenty to do right in the campground or there is yellowstone a short 30 minute drive away. We kayaked, hiked the loop, and hang out on the lake. There were small leeches in the water, so I wouldn't recommend swimming. Cell service was great and I had 3 different packages arrive for me while we were there. The staff delivered to our RV door! We camped at Henrys Lake State Park in a Fifth Wheel. Excellent alternative to pricier parks in West Yellowstone just 16 miles away. Not a resort by any means but the scenery and proximity to Yellowstone make it a great value. We camped at Henrys Lake State Park in a Motorhome. Spacious lake side campground. We camped at Henrys Lake State Park in a Travel Trailer. Bring bug spray. Mosquitos are very bad. We camped at Henrys Lake State Park in a Travel Trailer. Easy access to Yellowstone NP from here. If you stay here you get free access to another state park in Island Park that has great bike trails. The lake has the best trout fishing in the state. Yellowstone east entrance is about 20 minutes away, as is West Yellowstone town where you can eat or shop. I don't fish but this seemed to be a magnet for fishermen in and around the lake. If you want a huge, quiet space away from town, this is a great choice. Only 15 miles from west entrance to Yellowstone NP. A bargain! Be sure and have your National Parks Pass for free entry to Yellowstone. Otherwise it is $30.00 per car. Since we camped in 5th wheel we did not have to pay each time we left the park and returned. Very close to the Mesa Falls Scenic Byway. Mesa Falls is worth the trip - very nice park. Are you kidding...Yellowstone!!! Keep your gas tank full and your cameras ready. We caught two bison traffic jams. West Yellowstone about 25 minutes away. There is fishing, hiking, boating. The lake is beautiful with wildlife. Are you affiliated with Henrys Lake State Park ?